Tuberculosis was once a dreaded disease in Europe as well as North America and virtually everyone knew someone who had succumbed to ‘consumption’, the commonly used name for the disease caused by Mycobacterium tuberculosis. Tuberculosis is still widespread in most third world countries and after the fall of the Soviet Union, the numbers of tuberculosis patients have sky rocketed in Russia as well as in many other post-soviet states. What few of us know, however, is that a bacterium closely related to Mycobacterium tuberculosis called Mycobacterium marinum can be present in wild caught as well as captive bred fish and stay lurking in our aquariums without us ever realizing it. After all, when one of our fishes goes belly up, few of us drag out the Petri dish and starts growing bacterial cultures to find out exactly what caused its demise. Since Mycobacterium marinum is so closely related to Mycobacterium tuberculosis, the disease it causes is commonly referred to as fish tuberculosis of fish TB. Learning more about fish tuberculosis is recommended for all aquarists since it can be lethal to our beloved fish. What’s even worse, Mycobacterium marinum can spread to the aquarist and cause serious health problems. It can also spread to other animals and is capable of surviving in both soil and water without any host for prolonged periods of time. Don’t be fooled by the word “marinum” – this nasty little organism will survive just as well in freshwater conditions. Certain types of fish seem to be more at risk of carrying, or at least succumbing to, fish tuberculosis. This group includes the labyrinth fishes, among which you will find many popular aquarium fishes such as Bettas and Gouramis. 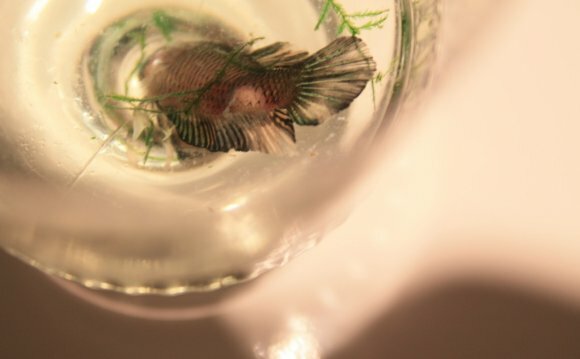 The main symptoms of fish tuberculosis are loss of scales, loss of color, lesions on the body, wasting, and skeletal deformities such as curved spines. Looking a slides of infected tissue under a microscope is sometimes enough to recognize Mycobacterium marinum, but in most cases a bacterial culture will be necessary. Both Mycobacterium tuberculosis and Mycobacterium marinum are acid fast, which means that they stain bright pink against a blue background. Treating fish tuberculosis is really difficult and euthanizing the fish a probably less painful for the fish than forcing it to go through endless treatments that may not have any effect on the disease. Euthanizing all the fish in the infected aquarium is also the best way of preventing the disease from spreading. If you decide to try and treat your fish, keep in mind that Mycobacterium marinum can infect you as well. The risk of being infected can however be decreased dramatically by following a few simple safety guidelines. You can read more about this further down in this article. Fish can be treated with the same drugs as humans get when they become infected by Mycobacterium marinum, e.g. Kanamycin. Since this is a very resilient microbe, normal treatment involves administering at least two different medications over the course of at least three months. A lot of aquarium problems can be fixed by performing frequent water changes, increasing the water temperature and adding some salt to the water, but fish tuberculosis is not one of them. Raising the water temperature may even worsen the problem since Mycobacterium marinum prefers warm water (their ideal temperature is 30°C). Since curing fish is virtually impossible once the disease begins to manifest, preventative measures are highly important. Keeping your fish healthy, happy and well-fed will boost their immune system and make it possible for them to handle limited exposure to Mycobacterium marinum. Wounded or otherwise weakened fish should be moved to quarantine tanks where they can be treated and given time to recuperate, since weak fish that is left in the main aquarium can serve as a breeding ground for all sorts of malicious microorganisms that may eventually grow numerous enough to attack even the healthy fishes.